1 of 2 In a medium-size bowl, combine tomatoes, onion, jalapeno pepper, lime juice, cilantro, olive oil and salt. 2 of 2 Spoon into 2 mason jars (1 cup) and seal. Refrigerate for up to tk. 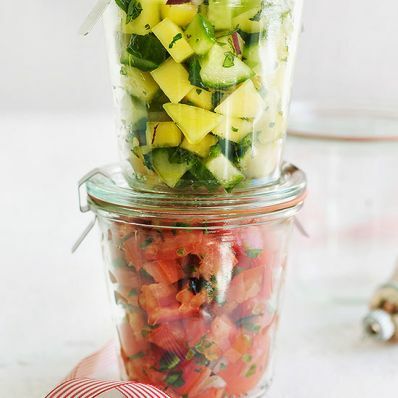 1 of 1 Make a Mango-Cucumber Salsa by substituting 1 cup each diced mango and diced, unpeeled English cucumber for the tomato.